We saw a change atop the PFFELO rating system! 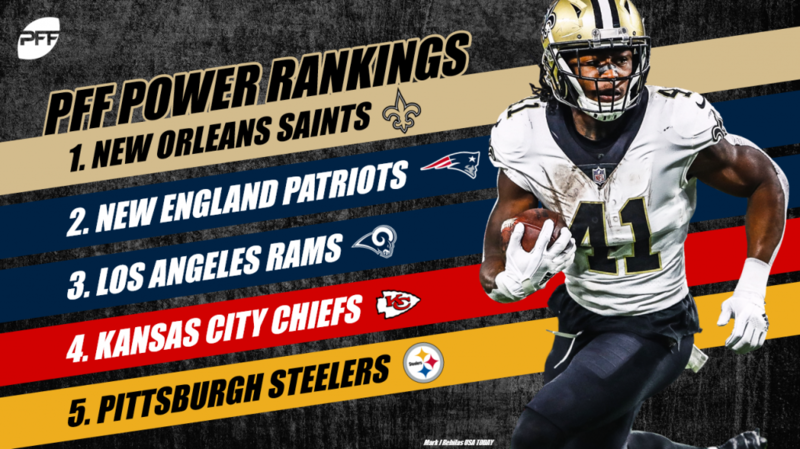 For the first time since we’ve developed the PFFELO system, the New Orleans Saints are the number one team in football. 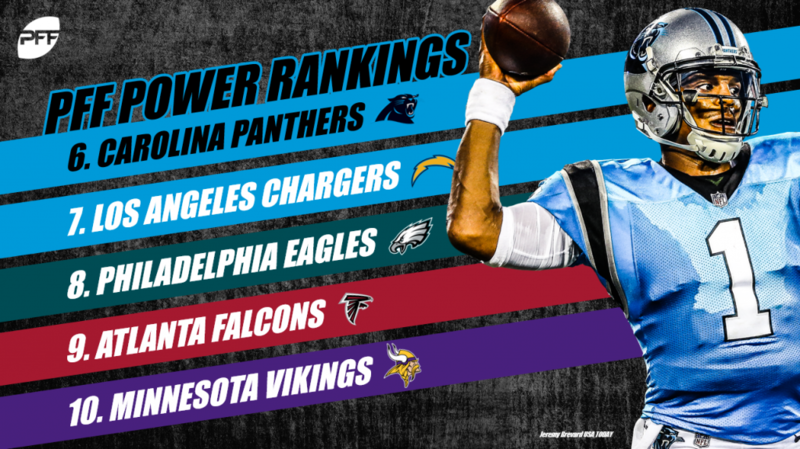 Pittsburgh and Carolina, representing foes in this week’s Thursday night matchup, made moves this week to get into the upper-echelon discussion, while we’re starting to collect some real, stable duds at the bottom of the rating system. Week 10 presents some…interesting matchups, to say the least. For example, a heavy favorite playing at home is expected to outplay the visitor, so a victory would result in only a small rise in their PFF ELO rating and a similarly-small decrease in the defeated team’s. However, if an upset were to happen, the visiting team would see their PFF ELO rating rise substantially, and the home team’s see a similarly-sized drop. The Saints take over the #1 spot after a convincing win at home against our previously top-ranked Rams. Currently, we project the Saints to finish with 12 wins and almost a 19% chance of winning the Super Bowl. Drew Brees has been phenomenal this year, posting the highest accuracy percentage in the NFL at 83.8%. He also leads the NFL in our WAA metric, posting 1.87 wins above average. The Patriots took care of the Packers in the showdown of Brady vs. Rodgers. New England now has the highest odds to win the Super Bowl at 20%. The Patriots can beat you any number of ways and are benefitting from a number of shrewd roster moves to add talented veterans around Tom Brady. The McCourty brothers have been exceptional in coverage, combined they have added 1.1 WAR (Wins Above Replacement) for the Patriots. The Rams lost to the Saints in a game that quite often felt on the verge of turning into a blowout. Our win total expectation still predicts about 12.5 wins for the Rams, but their Super Bowl odds have dropped down to 14%. The notable on brand point is that Todd Gurley has only the 7th highest W.A.R on this Rams team. Although Gurley gets the headlines, Jared Goff, his trio of receivers and the stellar defensive performances by Aaron Donald and Nickell Robey-Coleman are what separates this team from the pack. Marcus Peters, on the other hand, has been downright atrocious, posting a -0.56 W.A.R and allowing a passer rating of 145.2 when in coverage. Rounding out the distinguished top four are the Chiefs, who actually have our highest projected win total in 2018 at 12.6 wins. The Chiefs’ Super Bowl odds are just shy of 16% and the third-highest in the NFL right now. Patrick Mahomes has the highest W.A.R in our current system at 4.64. The Chiefs’ passing attack is dominating early down attempts with an EPA generated of 0.32, and they have posted a successful pass play on 55.2% of early down attempts. 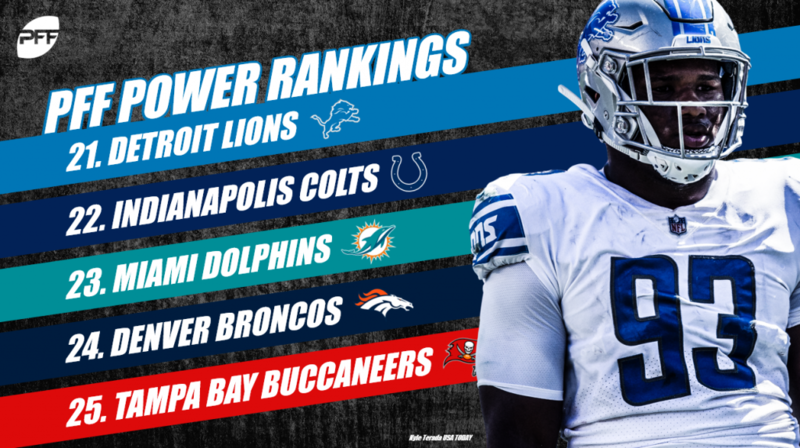 They just need to improve in small increments defensively, as right now they are the second-worst pass defense in the AFC from an EPA allowed standpoint. There is a significant 20 ELO point gap between our 4th and 5th ranked teams. This is where we see a significant drop off in expected performance going forward as currently, the Steelers have a 6.5% chance of winning the Super Bowl. Words no one could have predicted before 2018, but James Conner is actually the number one running back from a W.A.R standpoint in 2018. Big Ben Roethlisberger is only the ninth-most valuable Steeler according to this metric, so room for improvement does exist. To improve, Big Ben will have to cut down on his negatively graded throws, as 17.1% of his attempts have been negatively graded -the has the fourth-worst mark among current starting quarterbacks. Winning a shootout at home against the Bucs, the Panthers still have almost a 20% chance of winning the NFC South from the Saints. Cam Newton has been instrumental to the success of the 2018 Panthers. Newton has found his rhythm completing high percentage throws with a 78.4% accuracy percentage, and he has the fourth-highest percentage of throws receiving a positive grade. Luke Kuechly continues to prove that middle linebackers are still relevant especially when they can cover. Kuechly has by far the highest WAR among linebackers at 0.77. The Chargers won a big matchup on the road in Seattle on Sunday. Since the start of 2016, the Chargers have the second-biggest change in PFFELO ratings, which shows the success that Anthony Lynn has had with this team. The expectation is for 10.5 wins in 2018 and right now we have their super bowl odds just shy of 3.5%. The Chargers are the best passing team in the league from an EPA standpoint on early downs. They have generated 0.42 EPA per pass attempt with a 58% success rate on early downs. Those type of numbers will lead to success in the playoffs. The Eagles come out of their bye needing to hit their stride if they want a chance to repeat as Super Bowl champions. Currently, our model has them at a mere 40% to win the NFC East. The Eagles have to throw better on early down attempts to avoid 3rd and long situations. Carson Wentz has been accurate in his return, posting an 80.1% accuracy percentage, but has thrown a turnover-worthy pass on 3.9% of attempts. With road matchups still pending against the Saints and Rams, the opportunity to make up ground in the NFC still exists, but how they perform will go a long way to seeing if they are ready to compete in these same environments come playoff time. The Falcons finally blew a team out on the road, and Julio Jones finally scored his first touchdown of 2018. Thankfully, we have other metrics to measure value to a team, and at 1.24, Jones has the second-highest wins above replacement among wide receivers in 2018. Posting this number while only scoring one touchdown is simply astonishing and shows the dominance Julio has displayed this season. The Falcons have a long way to go if they want any shot at winning the NFC South. Currently, we give them only a 5.5% chance to pull off an amazing comeback. The Vikings are banged up at wide receiver but were still able to grind out a victory against their division foes on Sunday. The return of Everson Griffen was a welcome addition, as he recorded six pressures for a Vikings team that combined to record a pressure on 23 of Staffords 49 dropbacks. Those 23 pressures resulted in 10 sacks, as the Vikings defense finally flashed that signature Mike Zimmer chaos. At 5-3-1, we have the Vikings winning the NFC North 61% of the time with a shot at the Super Bowl 3.6% of the time. The Bears drubbed the Bills in a tuneup for their three straight weeks of conference games coming up. Without a significant turn around from Mitchell Trubisky, this team may not be able to go very far. Trubisky is the only starting quarterback in the NFL to have a higher percentage of negatively graded throws compared to positively graded throws. 4.7% of his throws have graded as turnover-worthy throws, which is tied for the worst mark among active starting quarterbacks. It’s not surprising, but his WAR of -2.53 is by far the worst mark in the league. There are positives on this team, mainly the defense, but without a solid starting quarterback, they are simply outclassed by the top of the NFC. The Seahawks dropped to 4-4 after losing at home to the Chargers in a game they needed to win to stay relevant in the NFC. We have them pegged to win 8.4 games which probably won’t be enough to earn a wild-card berth. Russell Wilson has the second-highest percentage of big-time throws at 8.9% and is doing everything possible for this team. The coaching staff simply isn’t putting this team in position to make positive EPA plays on second downs, which has resulted in a significant amount of third and long situations. On second downs they have by far the worst percentage of successful play calls that would result in a positive EPA situation. The Ravens didn’t get much going offensively on Sunday and fell to their division rival Steelers at home. At 4-5 they have a lowly 1.9% chance of winning the AFC North. Joe Flacco continues to be Joe Flacco and has posted a near-neutral EPA per pass attempt at 0.03. This team is only as good as their defensive unit. Jimmy Smith hasn’t exactly performed since returning from injury and has allowed a passer rating 118.9 on throws into his coverage. The Ravens have won exactly one game since he returned. The Titans pulled off the upset on the road against Dallas on Monday night and head home to face the Patriots with some momentum coming out of their bye. At 4-4, the Titans still have a 28% chance of winning the awful AFC South. Marcus Mariota has performed well when under pressure but has to improve his decision making when kept clean. Mariota has a turnover-worthy throw on 4.5% of his dropbacks, which is the third-worst mark in the NFL. Mike Vrabel has this defensive unit playing much better than expected and on early down plays, they have allowed a successful pass on 47.8% of attempts and a successful rush on only 35.6% of attempts. After a disappointing loss at home to the Falcons, Washington is still the favorite to win the NFC East at 52.8%. However, they’ll need stronger play from Alex Smith if their defense and injuries to their offensive line put them in the same position they were in on Sunday. While only 10% and 2% of his throws are negatively graded and turnover-worthy, respectively, Washington has gained just 0.04 EPA per play on Smith’s dropbacks, putting into question what they’ll be able to do if given an opportunity to play an elite team in the playoffs. This one has been frustrating for us, as we gave out the UNDER 8.5 wins before the season. After starting 0-3, the Texans have won close games against Indy, Dallas, Buffalo, and Denver. Moving forward, they have to protect Deshaun Watson better, because he’s been very good at times this season. Among full-time starters, Watson’s rate of positively-graded throws is the highest, and DeAndre Hopkins has been one of the most-valuable non-QBs in the league so far. If they can combine for more brilliance in the second half of the season, they could offer up a viable fourth AFC playoff team come January. In what has been a top-10 schedule in terms of difficulty this season, the Packers lost two difficult road games the last two weeks against Los Angeles and New England, two games in which they very much looked like contenders but ultimately fell short. With just a 5.2% chance to win the division and a 10.5% chance to make the playoffs, the Packers might be left with a legitimate MVP candidate in Aaron Rodgers (our leader in WAR so far) at home come January. The Bengals come out of their bye with a 5-3 record, but without their best player and against the league’s best team. With the Pittsburgh Steelers surging, they are likely in a dead heat for the sixth seed in the AFC, and with a tiebreaker in hand against the Dolphins and Ravens, they are a 48.6% chance to make the playoffs here moving forward. It’s hard to think of a more difficult team to watch than the Dallas Cowboys. One of fewer than a handful of teams actually averaging positive EPA on early-down runs, it hasn’t mattered so far this year – Dak Prescott has generated big-time throws on fewer than 4% of his dropbacks, and the Dallas offense hasn’t been able to generate a positive EPA on his dropbacks. The Jaguars return to London with an opportunity to gain some ground in the AFC South on the road against Indianapolis. They were absolutely dominant against the Colts last year, winning 27-0 and 30-10 in their two outings. 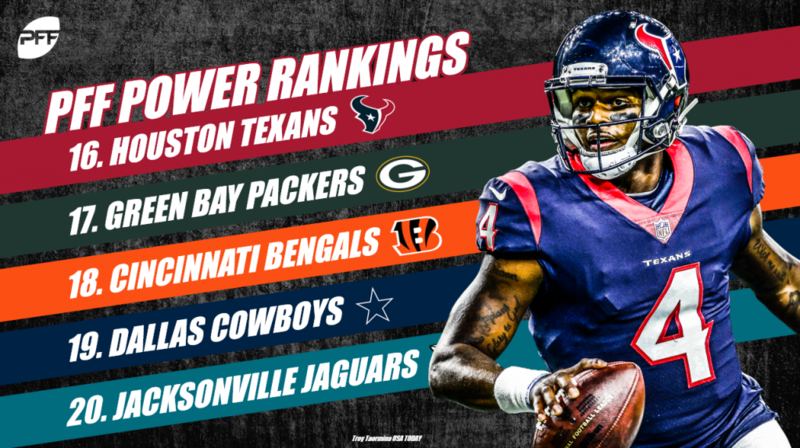 They’ll need Blake Bortles, who has had his ups and downs this season (generating the third-worst early-down efficiency in the NFL) to move the offense at least as well as he did last year, for the division repeat to be even a remote possibility. This is probably a bit high for the Lions, but we just can’t quit their offensive supporting cast (even without Golden Tate). Kenny Golladay is giving Matthew Stafford a 119.4 on his targets so far this year, while Marvin Jones is at 113.7. 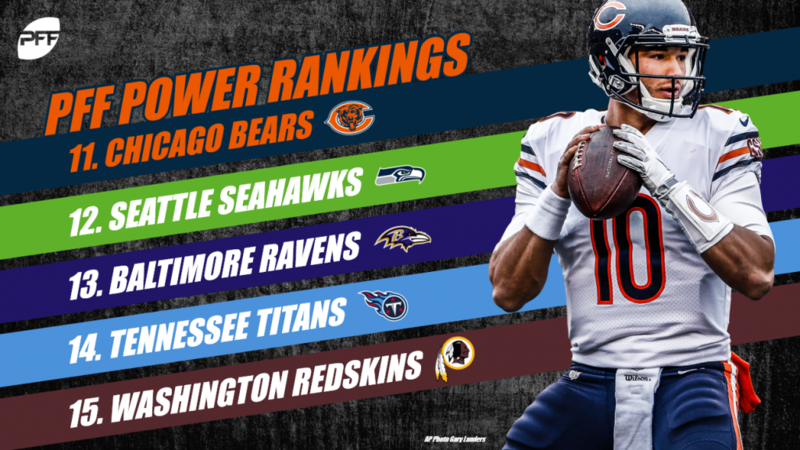 Their offense is likely to keep them in games moving forward, especially this week against the Bears, but it’s going to take their defense (allowing positive EPA on early-down runs and passes) a while to rebuild. This is the darkest of dark horses in the AFC. Andrew Luck has played very, very well since returning to the starting lineup this year, generating a positively-graded throw on over 27% of his dropbacks. They have three straight at home coming up, with the league’s easiest overall schedule. A 2.5-game deficit and a tiebreaker might be too steep to take back the AFC South, but we think their odds are better than most do. The Dolphins are the worst team in these ratings with a winning record, sitting at 5-4 after a sweep of the Jets. Assuming Ryan Tannehill plays moving forward, things set up for the ‘Phins to take that sixth and final playoff spot in the AFC. They have a bottom-10 schedule in the league, with two games coming up against Buffalo and their remaining New England game at home. I think the Broncos are an altitude-induced-September-homefield advantage away from being among the bottom teams in the league. The Case Keenum 2017 magic has not materialized in Denver, as he’s been barely above replacement level, throwing an interception in every game and producing positively-graded throws on less than 20% of his dropbacks. Tampa Bay’s defense has been a path of least resistance of late, allowing over 60% of early-down passes to generate success since the start of the season. That’s the worst mark in the NFL and will put their quarterback combo of Ryan Fitzpatrick and Jameis Winston in a constant position to generate positively-graded throws at the highest rate in the NFL, which they’ve surprisingly done through the season’s first nine weeks. While the Jets surprised a bit early in the season, optimism has waned a bit with Sam Darnold’s struggles. Over 5% of his dropbacks have been turnover-worthy so far this year, while the Jets offense is losing an average of 0.23 expected points added each time he drops back. 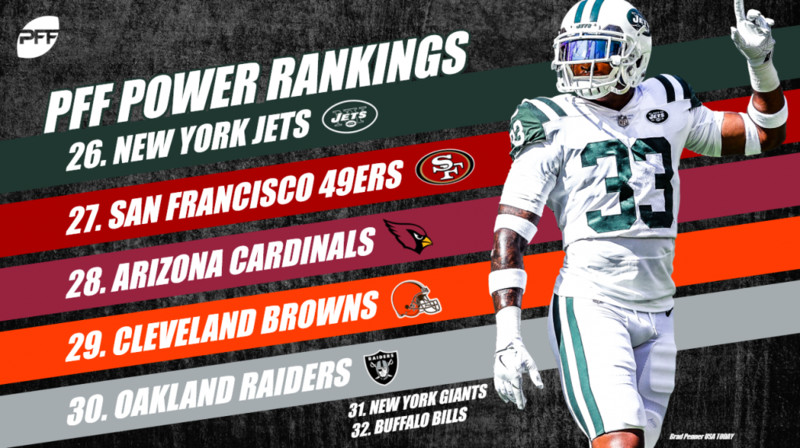 Unless this improves, it will be difficult for them to even beat the Bills moving forward. The Cardinals are coming off of a bye, with some time for new OC Byron Leftwich to put Josh Rosen in a better position to succeed than Mike McCoy did. Rosen’s 5.7% of dropbacks resulting in a big-time throw is something to work with, but they will have to improve on their 33.6% early-down success rate running the ball to get David Johnson going and move their offense forward. Cleveland battled last week at home against Kansas City, but ultimately were unable to win or cover against an offense that was perfect throwing the ball over 10 yards and between the hash marks (with two touchdowns). With another strong team coming to Ohio this week in Atlanta, it will be interesting to see when they get their next win. The market moving from 49ers (-3) to having the Raiders as short favorites Thursday night tells you all you need to know about the a) unpredictability of the NFL season so far and b) how poorly the Raiders are constructed and are playing so far this year. From a W.A.R perspective, their first-round pick (Kolton Miller) has been their second-least valuable player through nine weeks, bringing into question how well they’ll be able to use the five they have over the next two years. Only the Arizona Cardinals have lost more PFFELO points since the start of 2016 than the Giants. However, after a week off, we actually like the Giants next week in San Francisco for PFF Greenline, as they are three-point underdogs against a team quarterbacked by Nick Mullens. Woof. In hindsight, the Bills might harbor a little regret over having beaten Minnesota and Tennessee early in the season. While their first-round pick was a linebacker, it’s two veteran players at the position, Matt Milano and Lorenzo Alexander, that have been their two most valuable players so far this year via our WAR model.